Heartworm is a preventable disease that affects both dogs and cats. The life cycle of the heartworm begins when a mosquito bites and feeds on the blood of an infected dog that is carrying tiny immature heartworms, called microfilariae, in its blood. The mosquito takes in the immature heartworms when it feeds. During the next two-to-three weeks, the larvae develop into the infective stage within the mosquito. When the mosquito feeds again, it can transmit infective larvae to a healthy dog. The larvae enter the dog's body through the mosquitos bite wound , migrate through its tissues, and develop over the next few months, eventually reaching the dogs heart and lungs. 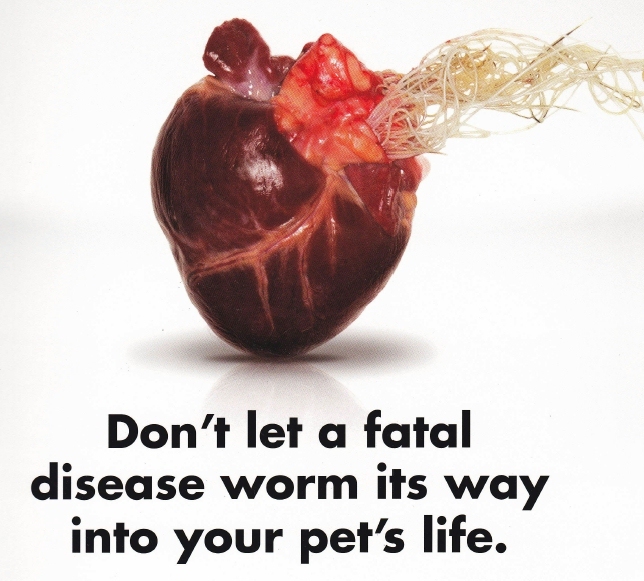 Heartworms may be present in the heart and lungs approximately four months after initial infection. Once in the dogs heart, the worms may grow to between 7 and 11 inches in length. and cause significant damage to the heart and lungs. If left untreated, heartworm disease may result in death. After adult heartworms mate and produce immature heartworms an infected dog which is bitten by an uninfected mosquito will transmit microfilariae to the mosquito, beginning the cycle again. The life cycle of the heartworm is approximately 6 months. Whether your dog spends lots of time in the great outdoors, rarely ventures out of your own back yard, or is strictly an indoor dog, its at risk of exposure to heartworm. In fact, unless your dog is protected, with a monthly dose of heartworm medication which is administered once a month by the pet owner and as directed by your veterinarian, this parasite can endanger its health. Fortunately, heartworm disease can be prevented. Signs of heartworm disease can take as long as four to seven months to appear after initial infection. However, an infected dog may start coughing within four months of infection. Other signs may include sluggishness, weight loss, and difficulty breathing. A dog that is typically active may become less active. The degree of infection, the length of time a dog has been infected, and the individual animals response to the infection determine just how severe the signs of the disease can be. If you suspect your dog has heartworm disease, your veterinarian can perform a simple diagnostic blood test. Dogs with heartworm disease can be treated to eliminate adult heartworms inside the dog's heart and lungs, but treatment is costly and potentially dangerous as it involves killing the adult worms inside the dogs heart. Since the treatment is risky and requires multiple injections, dogs with heartworm disease must be treated at the veterinary clinic. Complete rest is needed for four to six weeks following treatment.